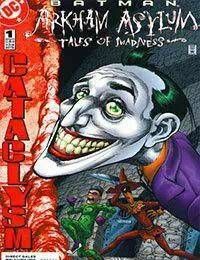 Gothams inmates are running the asylum in this Cataclysm one-shot! When the quake strikes Gotham, Arkham Asylum closes up tight as a drum. Freed from their cells, the inmates have taken a rookie guard hostage as part of an elaborate contest: whoever tells the scariest tale wins the guard, to do with him as he will.